Today marks the anniversary of the birth of Oliver Goldsmith in 1728. This celebrated playwright, author and poet's work has endured since the Georgian era and many of his plays are still in regular performance today. 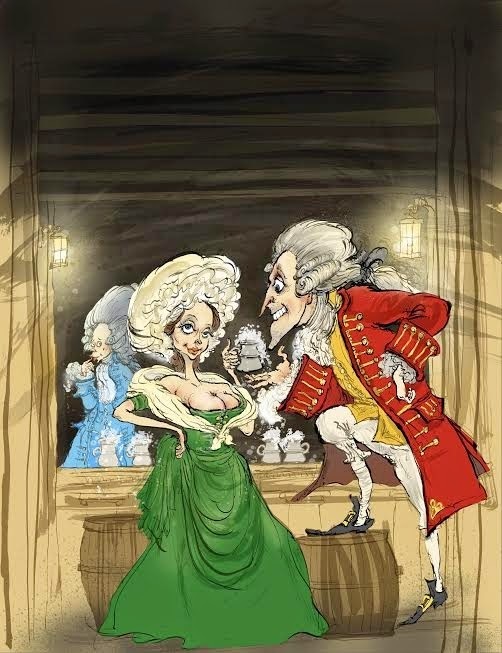 Last week my colonial gentleman and I were lucky enough to have tickets for the new Northern Broadsides' production of Goldsmith's She Stoops to Conquer at the West Yorkshire Playhouse. Given that this anniversary comes to close to my outing, I thought I would share my review of the production with you today! She Stoops to Conquer, first performed in 1773, is not possessed of the most complex plot. Salt of the earth, old-fashioned sort, Mr Hardcastle, hopes to marry his daughter, Kate, to Marlow, the son of his best friend. Whilst confident and quite the rake with women of a certain sort, with those who are his social equal, young Marlow finds himself paralysed by anxiety. It is left to Kate, therefore, to assume the guise of a simple lass to win his heart. Throw in a pivotal practical joke played by a spoiled heir-in-waiting, a secret romance and planned elopement and the social climbing snobbery of Mrs Hardcastle and you have the makings of a wonderful night of comedy. I am a huge fan of Goldmsith and Northern Broadsides alike, and this production does not disappoint. As Marlow, all cocky swagger with the barmaid and barely even able to spit out two words with the fine Miss Kate, Oliver Gomm gives us a masterclass in physical comedy. I am not usually a one for slapstick but his stumbling, stuttering audience with his bride-to-be was a joy to behold, even if my companion felt it stretched credibility just a little. He is ably matched by Hannah Edwards as Kate, possessed of a quiet streak of rebellion which finds its full expression when she masquerades as the Liverpudlian "poor relation" who charms Marlow with her wit, intelligence and beauty. With the young men wrongly thinking that the house is a tavern and Mr Hardcastle a curious sort of landlord, there is much opportunity for silliness and the comedy of manners that Goldsmith so excelled at. We see perfectly the behaviour assumed when one pays for a service versus when one is the guest of a gentleman. So Marlow and Hastings, his supposedly worldly friend, treat the house as their own, leading to an eventual and hilarious explosion of temper from Howard Chadwick's blustering, bald-headed Mr Hardcastle. I have to admit that the standout performances for me came from Gilly Tomkins and Jon Trenchard as Mrs Hardcastle and her son, Tony Lumpkin, respectively. In a production full of bright colours and beautiful costume, their flame-red wigs stand out and both wear matching tiger and leopard skin costumes, Tony's set off perfectly with a hot pink cravat. Although Jessica Worrall's costumes are for the most part very accurate to the period, she allows herself the occasional pointed indulgence and they never feel awkward or like anything other than absolutely right for the production. So we do not question the animals prints worn by these loud, proud people, we instead recognise the signifier of new money and aggressive social climbing, with Mrs Hardcastle's breathless love of London, society and ladies over fifty a joy to behold. The Yorkshire-set production is helped along by a wonderfully evocative and adaptable set and music that has been newly written for the production and is performed live on stage by the multi-talented cast. Although my colonial gentleman felt that the production was just a tad overlong I cannot agree, I found every moment utterly absorbing and can hardly remember a theatre trip when I laughed so much. If you get the chance to see this show, I heartily recommend that you take it, you won't regret spending a couple of hours in the company of such an eccentric, entertaining production! There is nothing so cute as the awkward first meetings of those whose tongues are paralyzed because their hearts are thrashing wildly. My stories tend to capitalize on those moments. It just happens! I wish I could see the play. It sounds fabulous! I understand that the play was inspired by the story of a gentleman travelling in rural Ireland who mistook the house of the local squire for an Inn. It certainly proved a most fortuitous inspiration!